Hello there! It’s Emily from The Benson Street joining with you today to add some beautiful halloween decor to your home. 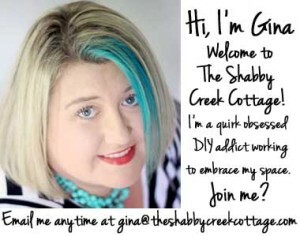 I love decorations that I can make myself but that look like I could bought them. 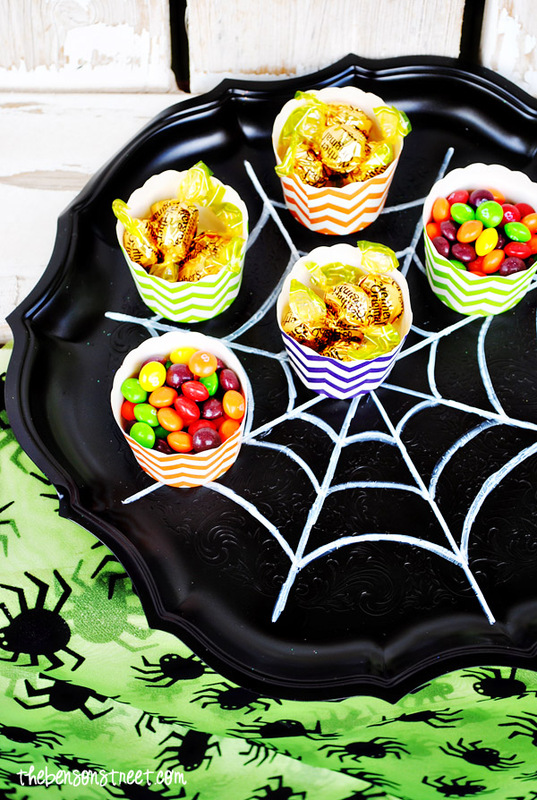 Plus I love candy corn and Halloween. 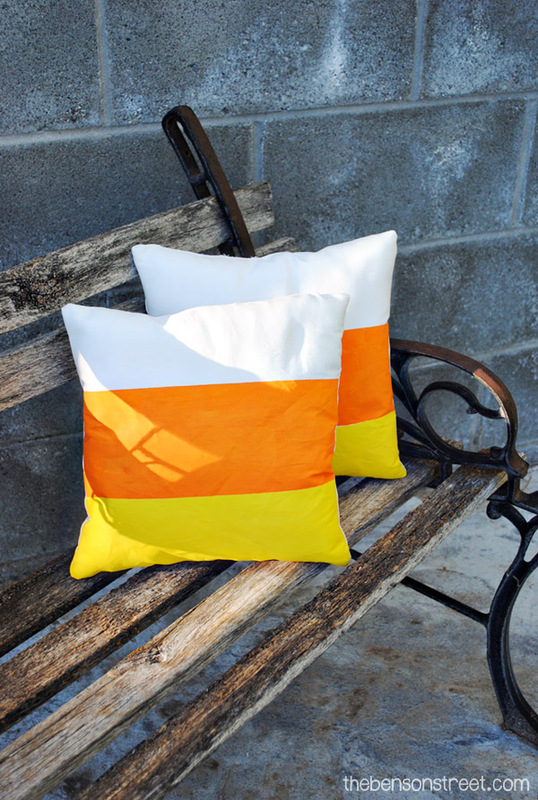 I combined my two loves and created this adorable outdoor (or it can be indoor) candy corn pillow. To begin divide the pillow in thirds. Each third of my pillow was 12″. I taped off the bottom four inches first and painted that section yellow using a foam brush. 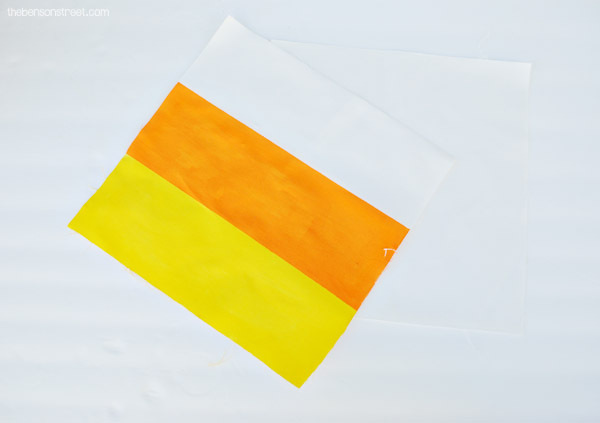 Be be sure to use enough paint to cover the white completely. Let it dry. Remove painters tape. 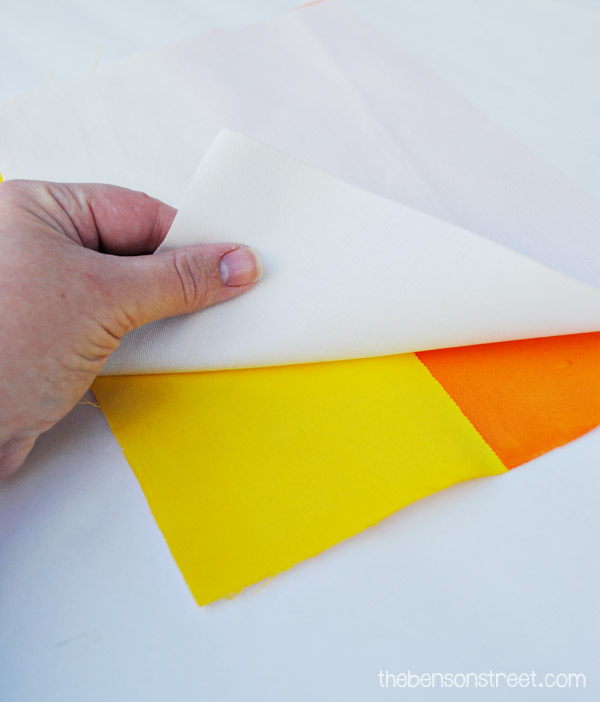 Tape a line on the edge of the yellow section and go up another four inches to tape off the middle section. 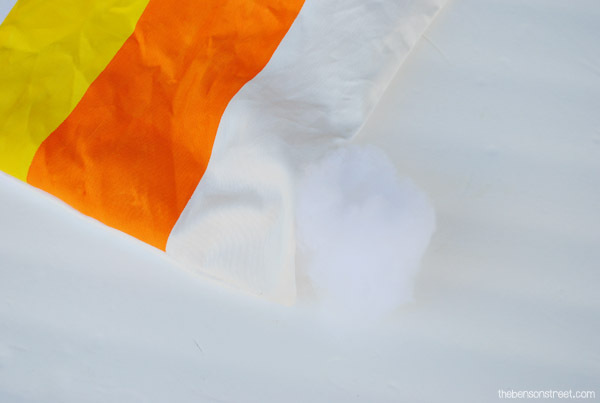 Paint it orange. Let dry. 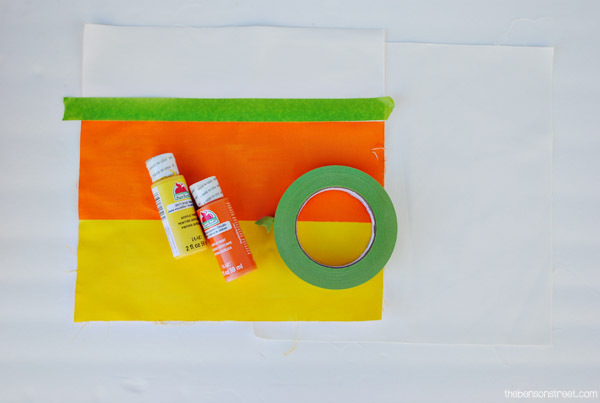 Remove painters tape. 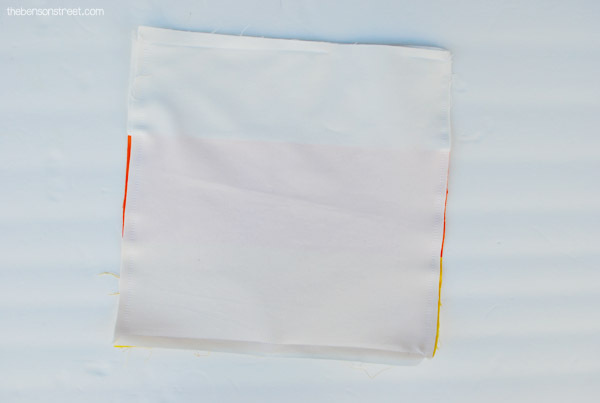 Take the painted square and the second square and put them together to sew with the painted side facing in toward the white canvas like this. 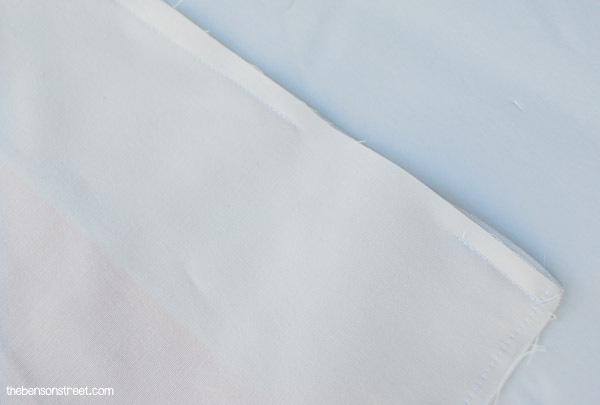 Pin the edges and sew around the square using a straight stitch and backstitching at the beginning and end, leaving an opening to turn the pillow inside out. 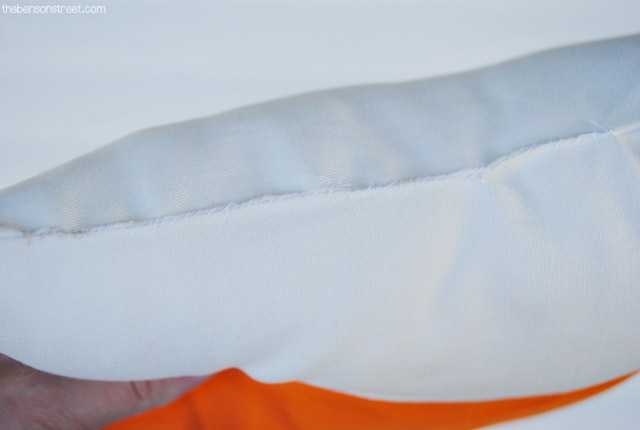 The pillow will look like this, with a small opening. I left my opening kind of small. It is easier to leave it a little bigger. 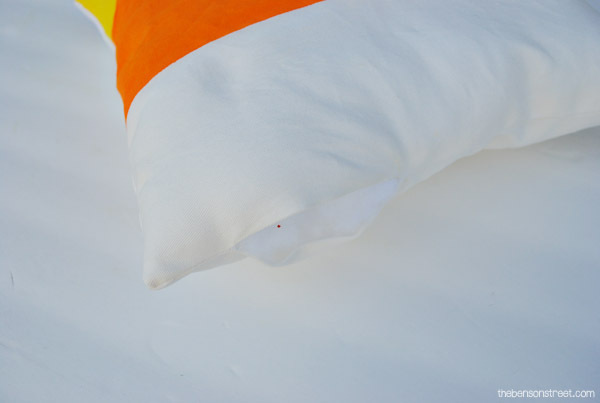 Turn the pillow to the right side by pushing it through the opening. Be sure to push the corners out well using a dowel. When the pillow is turned right side out it should look like this and is ready for stuffing. Begin the fill the pillow with stuffing through the hole. Continue to add stuffing until it is completely stuffed. Next to close the hole for inserting stuffing. 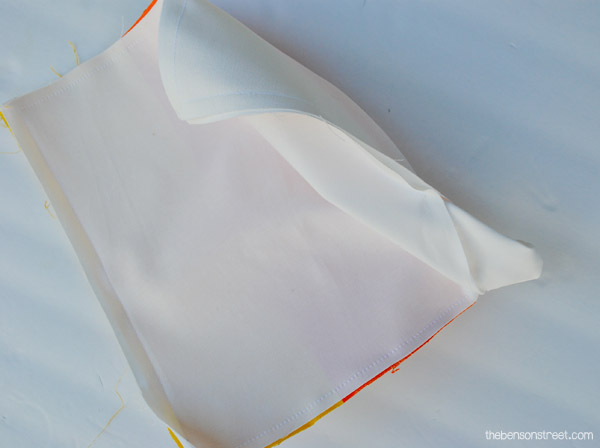 Fold in the edges so the look nice and flush with the already sew part. 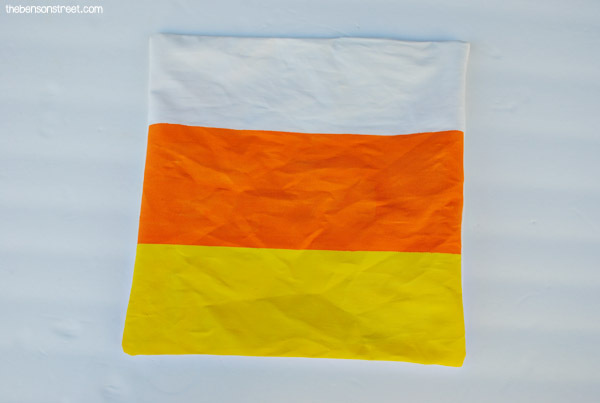 Pin it if needed and finish with a whip stitch using a needle and thread. Here is a video of the whip stitch, if you’ve never used one before. 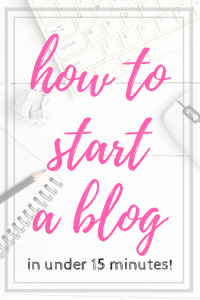 It is pretty easy. Or just go over this spot with your machine again. The last step is to make this pillow outdoor proof. 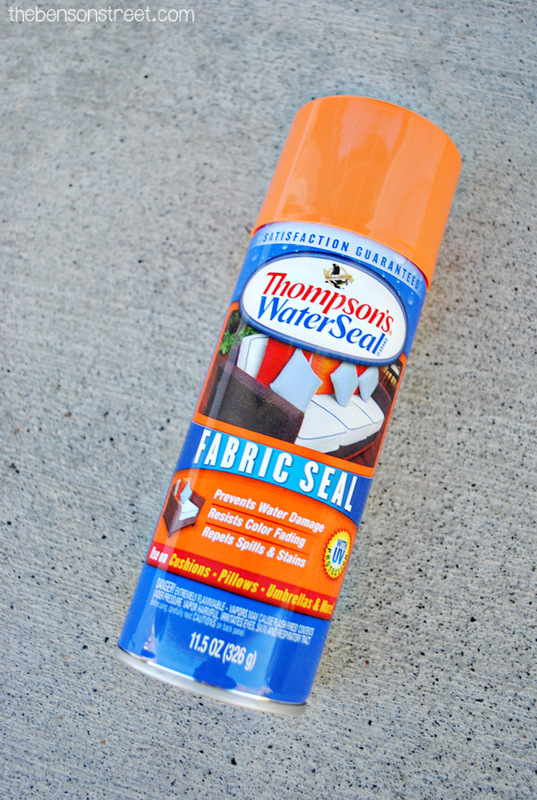 Use a fabric seal spray to set pillows for outdoor use. This will keep it from water and UV damage, but still allow you to dress up your front porch. 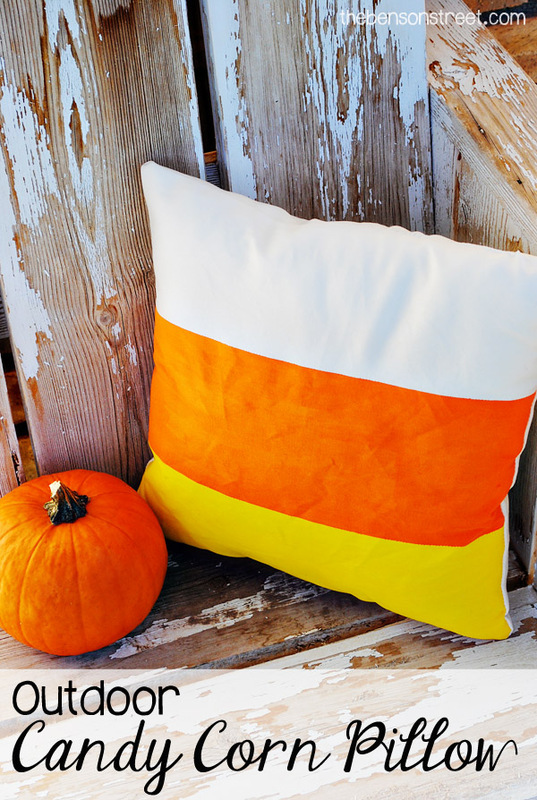 I love the candy corn inspiration and how beautiful it looks on any chair or bench. It would be fun to create a bunch of different sizes and load them up on a bench on the front porch. 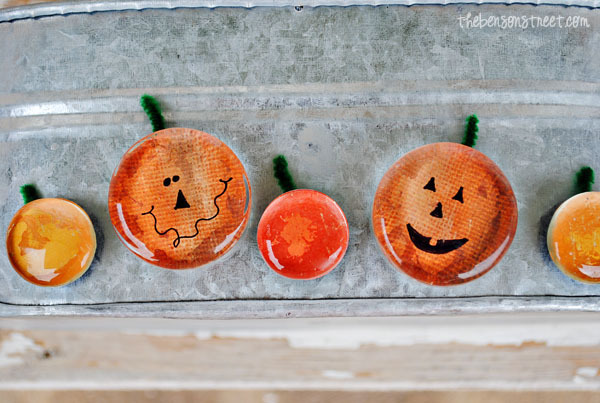 How do you decorate outdoors for halloween? 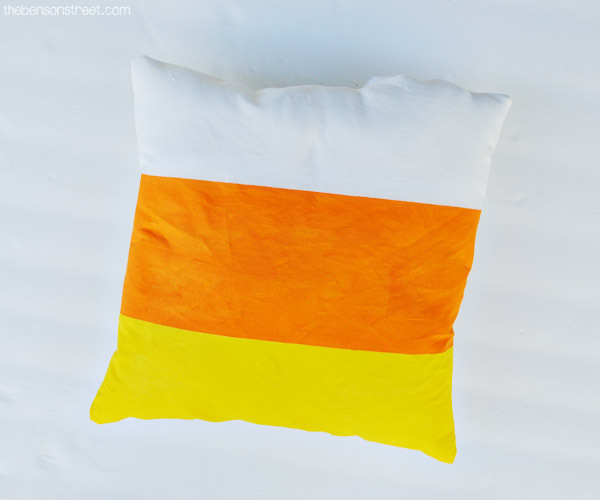 I think it’d be cute to also have rounded and narrowed the pillow to look like a candy corn. I am looking for some advice – I live in a modular home and my animals have pretty much destroyed a section of the skirting – the part that goes from the floor level to the ground on the outside. I never liked the way the skirting looked and want to do something cute, shabby & chic in place of it. It has to be weather-proof as I live in the pacific northwest and we get a lot of wind and rain. Any suggestions out there? You can look up Faux Panels they have some really cute stuff. They are pricey but it is quality stuff.